On June 22nd, 2018, bitFlyer, Inc. (Japan) received business improvement orders from the Japanese Financial Services Agency. Our management and all employees are united in our understanding of how serious these issues are. In order to maximize our efforts towards building a suitable service and improving on the issues identified, we have voluntarily and temporarily suspended the onboarding of new customers. We appreciate your understanding. This order is directed to bitFlyer Inc. (Japan) and not to its USA or European entities, which are regulated in their own geographical jurisdictions. Purchase Bitcoin in 2 easy clicks. You can trade 24 hours a day, 365 days a year. Bitcoin Trading Fee Please see the Fees and Taxes page. 1 The 100,000 JPY / 7 days limit is cumulative among virtual currency deposits, virtual currency withdrawals, Japanese yen deposits, Japanese yen withdrawals, the Bitcoin Bazaar, bitWire, and Bitcoin payments. 2 Unavailable until the registered mail has been received. 3 Applies to the Bitcoin Market, Altcoin Market, and Bitcoin Exchange. 4 Items easily exchangeable for cash cannot be purchased until the registered mail has been received. 5 The 100,000 JPY / 7 days limit is cumulative among the Bitcoin Bazaar and Bitcoin payments until the registered mail has been received. Apr 1 Transfer of Executive Officers at bitFlyer, Inc.
Mar 27 Announcing Changes in Directors for bitFlyer, Inc.
Jan 25 Announcing Changes in Personnel to the Representative Director and Directors of bitFlyer Holdings, Inc. and bitFlyer, Inc.
Sep 19 Announcing Bitcoin payments at H.I.S. Sep 15 bitFlyer selected as a partner vendor for Japanese Bankers Association's "Collaborative Blockchain Platform"
Apr 20 Gas bill payment with Bitcoin now possible through joint project with five major LP gas distributors. Mar 31 bitFlyer attained No.1 bitcoin trading volume in Japan for the second half of 2016. Mar 1 You can now make margin deposits in Bitcoin on Lightning FX! Oct 3 Points can now be exchanged for Bitcoins at points exchange site G-Point. Sep 7 Announcing a new service to get V-preca with Bitcoin. Aug 15 bitFlyer attained No.1 bitcoin trading volume in Japan for the first half of 2016. Apr 28 Announcing a new service with MONEY SQUARE JAPAN, INC. M2J Points can be exchanged for Bitcoins. Apr 22 Customers can now buy goods from our new e-commerce service, Bitcoin Bazaar! 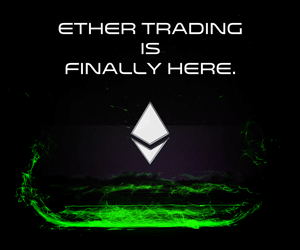 Apr 15 bitFlyer, Japan's largest Bitcoin / blockchain company, to release Ethereum exchange (beta) service! Mar 25 Deposit services are available 24h, 365 days via Internet banking and convenience stores! 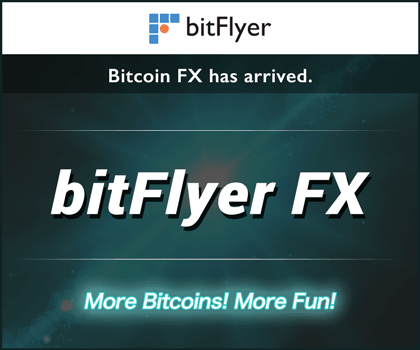 Mar 22 bitFlyer launching a new Bitcoin campaign with Central Tanshi FX Co., Ltd.
Mar 18 bitFlyer launching a new Bitcoin campaign with Credit Saison Co., Ltd.
Mar 11 Announcing a new service to get Amazon Gift Cards with Bitcoin. Feb 22 Announcement of new service 'Get Bitcoin'. Feb 8 Announcing a New Business Alliance with LIFECARD CO.,LTD. Thanks Points can be exchanged for Bitcoins. Feb 3 Announcing a New Business Alliance with Money Forward, Inc.
Jan 29 Notice on Memorandum Regarding the Receipt of Investments from SBI Investments Co., Ltd.
Jan 25 Announcing the Formation of Blockchain Angel Fund and Capital/Business Alliance with SIVIRA Inc.
Jan 20 Points can now be exchanged for Bitcoins at points exchange site PeX. Jan 8 bitFlyer is in it's 3rd year and Trade Grand Prix rewards are now 3x !! from Jan. 11th to Jan. 17th. Dec 24 10,000,000JPY in presents! Create an account or refer a friend to get bitcoin! Dec 24 bitFlyer 100,000th User Celebration! Dec 18 Points can now be exchanged for double the bitcoins at points exchange site PointTown. Dec 17 Points can now be exchanged for Bitcoins at points exchange site PointExchange. Nov 24 bitFlyer FX is now available! Oct 15 [Announcement] bitFlyer will arrange a joint bid for the final USMS Silk Road Bitcoin auction. Oct 14 bitFlyer Affiliate released! Oct 6 BITCOIN DONATIONS released! Sep 21 Check out the TRADE GRAND PRIX 2015! Total ￥300,000 in Bitcoin Giveaway. 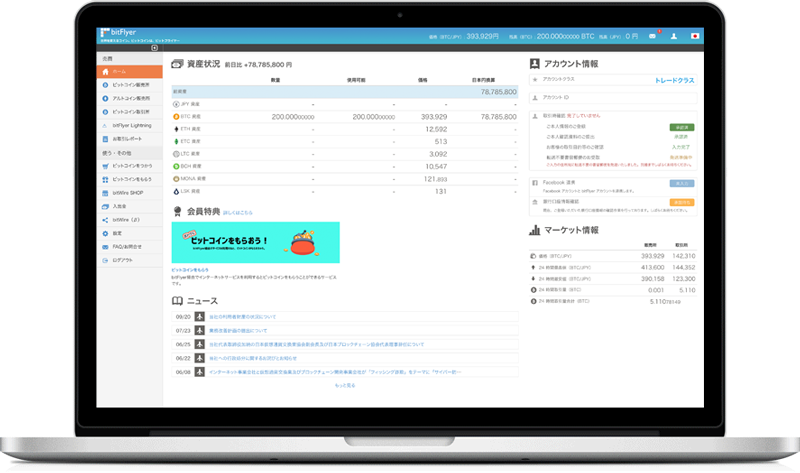 Aug 12 bitFlyer Raises JPY 510 million in Funds. Aug 3 Bitcoin Exchange (Easy Exchange) is now available. Jul 15 bitFlyer Lightning API released! 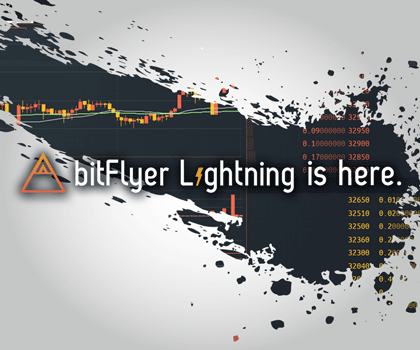 Jul 2 Our Bitcoin Exchange "bitFlyer Lightning" released! Jun 4 Bitcoin address audit tool released! May 11 Points can now be exchanged for Bitcoins at points exchange site Moppy. 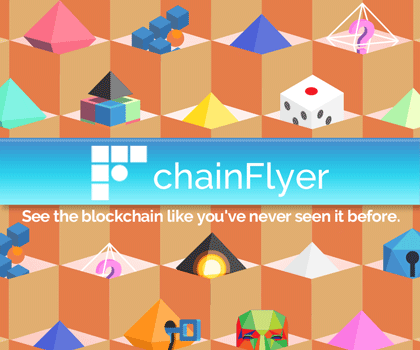 Apr 7 The all new blockchain visualization tool "chainFlyer" released! Mar 20 Android app "bitFlyer for Android" released! Feb 26 [Announcement] bitFlyer will arrange a joint bid for the third USMS Silk Road Bitcoin auction. Jan 28 bitFlyer raises approximately JPY 130 million in funds. Jan 9 We have released a two-factor authentication service which uses authentication applications such as Google Authenticator. Nov 27 [Announcement] bitFlyer will arrange a joint bid for the second USMS Silk Road Bitcoin auction. Nov 25 Market hours have been extended to 9am - 7pm. Nov 17 Corporate Accounts are now available. Nov 11 iPhone app "bitFlyer for iPhone" released! Oct 16 bitFlyer Raises Growth Capital from U.S.-Based Bitcoin Opportunity Corp.
Sep 22 [ Announcement ] Capital and Business Alliance with GMO Payment Gateway Inc.
Sep 22 An evening session is now available! Hours are 4:30-7pm JST. Sep 2 [ Release Announcement ] Bitcoin Crowdfunding site fundFlyer is Now Live! Aug 14 Account Authentication Now Faster - Up to Same Day Activation! Jul 30 Smartphone Friendly Web Page Released! Mitsubishi UFJ Capital Co., Ltd. is the venture capital arm of Mitsubishi UFJ Financial Group. Mitsubishi UFJ Capital supports company growth towards corporate value enhancement and IPO through management support services such as industry-leading consulting services and unique business knowledge and insight. MITSUI SUMITOMO INSURANCE Venture Capital Co.,Ltd. MITSUI SUMITOMO INSURANCE Venture Capital Co.,Ltd. is 100% owned by Mitsui Sumitomo Insurance Co., Ltd. Mitsui Sumitomo Insurance Venture Capital offers entrepreneurs broad support such as providing capital and networks to help early-stage R&D and commercialization. RSP Fund No. 5 is a wholly owned subsidiary of Recruit Holdings, Co., Ltd. Headquartered in Tokyo and with offices in Silicon Valley, RSP invests in and provides management support to IT companies that provide innovative products and services around the world. Venture Labo Investment Co., Ltd.
Venture Labo Investment Co., Ltd. supports the growth of its portfolio companies through management support based on field experience, fundraising support, business partner development, and cooperative relationship building with government agencies, in order to achieve a true hands-on investment relationship. Venture capital investment under the umbrella of SBI Holdings Inc., focusing primarily on investments in IT, biolife sciences, energy and the environment.In December 2015, we created new funds for the purpose of investing in promising start-up companies within the FinTech field. 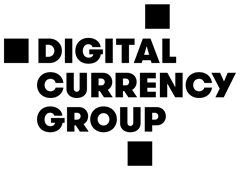 Dentsu Innovation Partners seeks to create a new digital industry through experience and the insightful knowledge of Dentsu Group companies to generate growth at investment targets. QUICK is a financial information provider in the Nikkei Inc. Group. QUICK provides comprehensive solutions to the securities and financial markets with supporting services for asset management, order routing, order execution, and construction and maintenance of information networks. GMO Venture Partners is the venture capital arm of GMO Internet Group, investing more than JPY 5 billion to 51 companies in total, including 8 listed companies. Headquartered in Tokyo and Singapore, GMO Venture Partners invests in domestic and international IT venture companies and supports business expansion as well as corporate value improvement. Mercari, Money Forward, raksul, Lancers, FreakOut and other major companies are among those to have received an investment from GMO Venture Partners. Company name changed from Bitcoin Opportunity Corp. Based in New York, Bitcoin Opportunity Corp is one of the most prominent Bitcoin investment funds in the world, with investments in noted virtual currency companies such as Coinbase, Xapo, and Bitpay. CEO Barry Silbert was named one of the "40 under 40" hottest business stars by Fortune Magazine. Since 2010, East Ventures has invested in growing IT ventures primarily in Asia and Japan. Companies that East Ventures has invested in include Coiney, BASE, TwitCasting, CAMPFIRE, mercari, and Tokopedia. Incubate Fund is a leading venture capital firm in Japan that specializes in investments to seed and early stage companies. Since Incubate Capital Partners was established in 1999, Incubate Fund has managed funds of 17.1 billion yen in total and has invested in more than 200 ventures. *These are the shareholders of our parent company, bitFlyer Holdings, Inc. Transfer Bitcoin and altcoin between an external Bitcoin and altcoin wallet and your bitFlyer account. Deposit JPY to your bitFlyer account, or withdraw JPY from your bitFlyer account to your registered bank account. Our online shop that lets you buy things in Bitcoin. Using these online services can reward you with Bitcoin. Make remittances in Bitcoin using an email address. If the recipient also has a bitFlyer account, it will be completed instantly. bitFlyer has partnered with various companies to support shopping in Bitcoin at their locations. 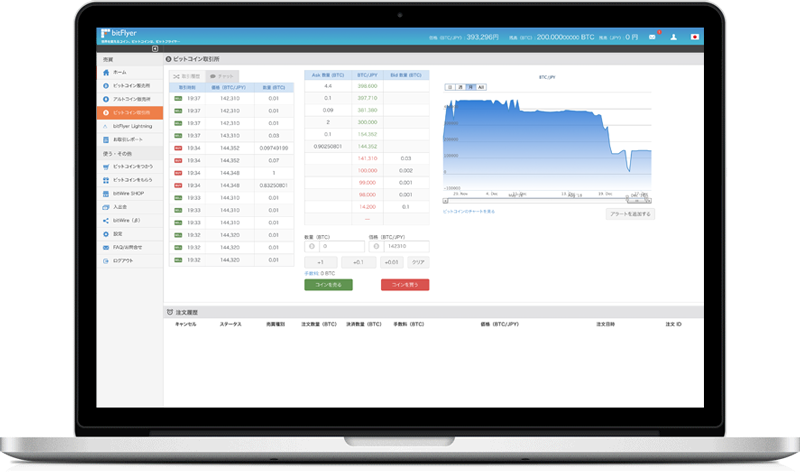 Buy and sell Bitcoin from bitFlyer using the JPY deposited to your account. Buy and sell altcoins from bitFlyer using the JPY deposited to your account. 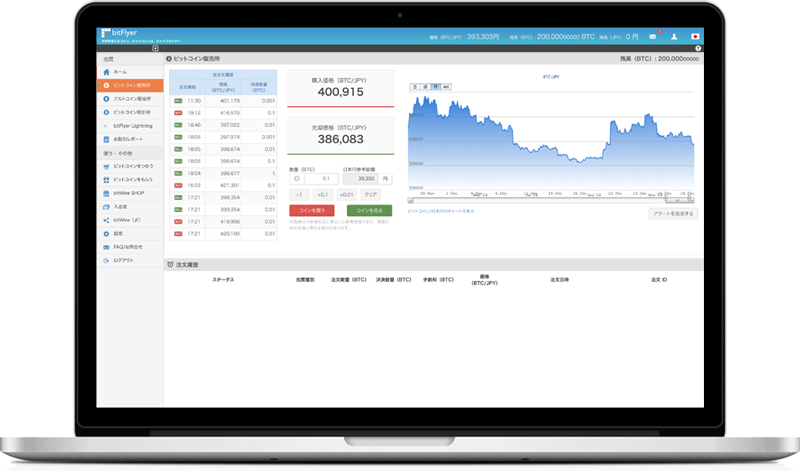 Trade Bitcoin and JPY with other users in our easy to use exchange platform. Trade Bitcoin and JPY with other users on our Spot, FX, and Futures exchange platforms. There is a cumulative 100,000 JPY / 7 days limit among virtual currency deposits, virtual currency withdrawals, Japanese yen deposits, Japanese yen withdrawals, the Bitcoin Bazaar, bitWire, and Bitcoin payments. Items easily exchangeable for cash cannot be purchased until the registered mail has been received. Transfer a deposit in Japanese Yen to your bitFlyer account to increase your funds available to buy and sell virtual currencies. With the Cancel Deposit button, you can convert your Japanese Yen balance in bitFlyer to cash. * In order to be able to trade with more than 3x leverage, you are required to confirm your bank account information. The following services are unavailable. The following points are posted on the Financial Services Agency's website. The inclusion of virtual currency exchange agencies in this list confirms only that, based on the concerned virtual currency exchange's explanation, the currencies they deal in meet the definition under fund settlement law. The Financial Services Agency and Treasury do not guarantee or endorse the value of these virtual currencies. Virtual currencies are not necessarily backed by assets. Please pay attention to the following points when trading in virtual currency. Virtual currencies are not a "legal tender" with values guaranteed by the country, such as the Japanese yen or dollar. They are electronic data exchanged on the Internet. The price of virtual currency may fluctuate. There is a possibility of losing money as the price of the virtual currency may plummet, suddenly become worthless, and so on. The virtual currency exchange must register with the Financial Services Agency/Finance Bureau. Please check whether or not the exchange is a registered business owner if using their services. When trading virtual currency, please seek explanations from the exchange, fully understand the transaction details, and proceed at your own discretion. Discussions about virtual currencies and fraudulent coins are on the rise. Please be cautious of malicious and fraudulent businesses who are piggybacking on the use of virtual currencies and the development of the virtual currency exchange industry.